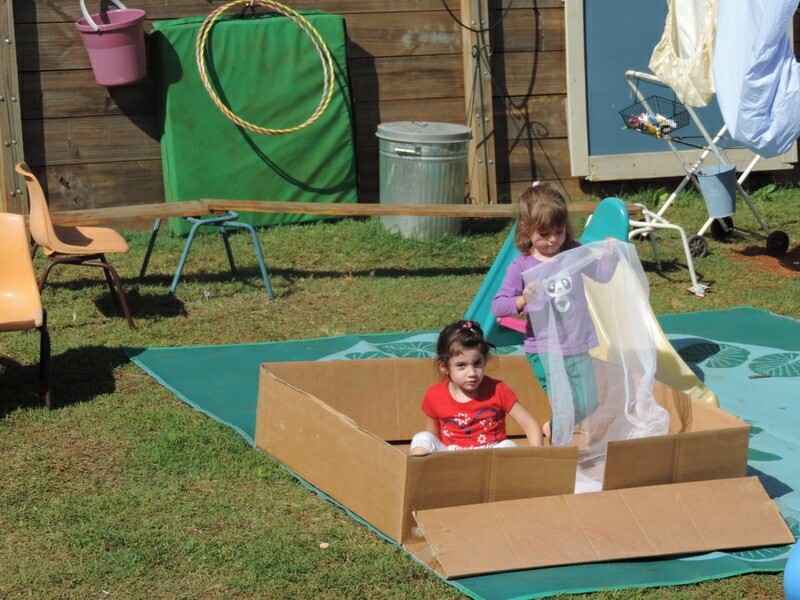 How to create opportunities for dramatic play outside. 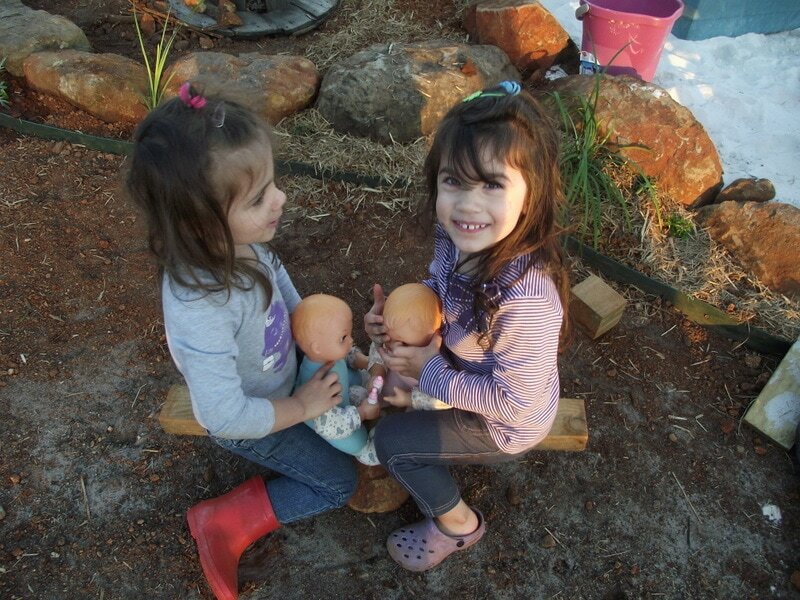 The outdoor learning environment offers a wonderful stage to inspire little imaginations through dramatic play outside. 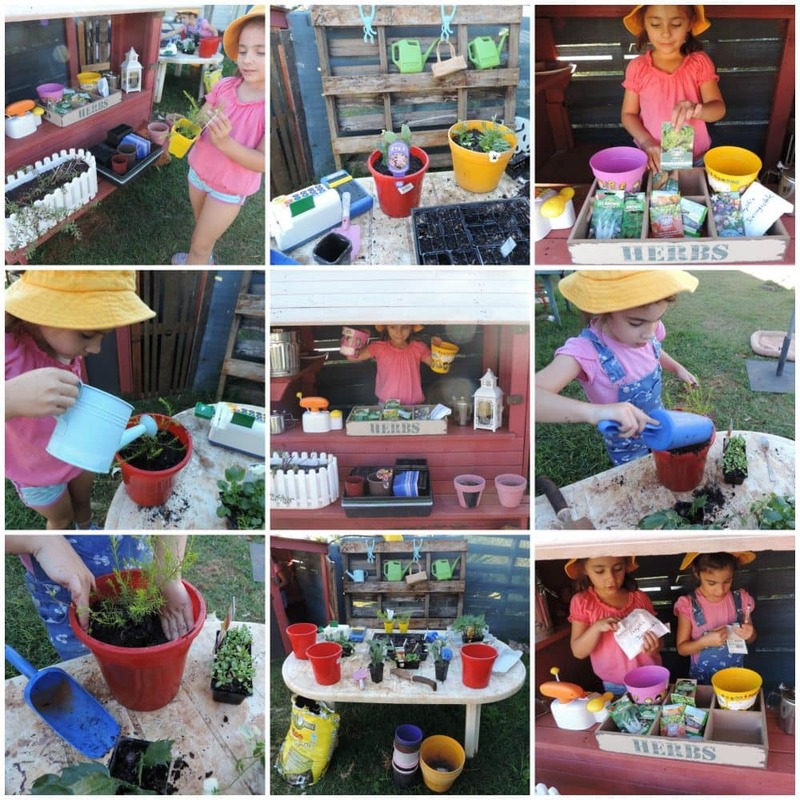 By adding a few simple props from either indoors or the yard itself and making varying arrangements to the regular outdoor play space and equipment educators and parents can stand back and watch the learning, social and emotional development, leadership, role play and conversations unfold organically. Dramatic play allows children to make sense of the adult world in a child-friendly setting and providing opportunities to encourage pretend play every day isn’t something that only occurs indoors or with complicated ‘setups’ and resources. Children will often show you the roles, experiences, materials and interests they would like to explore further and there is no reason why you can’t then extend upon this in the outdoor play space – besides, it’s so much more fun when you have the sun and wind on your back, tree branches swaying overhead and bits and pieces of nature to collect and add to your dramatic play. Children can also be a whole lot louder and busier outdoors usually…which they know! It’s also easier to leave the experience and play setup ready to become something different (or bigger and better!) the next day. It can be hard to do this indoors and let the play continue to grow and change. Now I can hear educators sighing at me and saying it takes so much time to bring everything outside each morning then bring back in the materials that can’t stay out overnight! 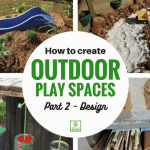 But what if you didn’t ‘bring everything out from inside’ – what if instead you just chose a few essential elements, loaded up a basket and blanket and added those materials to what you already have in the outdoor environment for children to access. What if you allowed the children to think about what they would like to add to your initial dramatic play props, what they could find as their play unfolded and they investigated, experimented, talked to each other, made plans and solved problems. Access to collections of loose parts and open ended materials will make this process much easier to evolve with little adult interference or direction. You can find more information about loose parts and how to begin building a basic collection in this article. What if you could still have fun and get creative setting up invitations to explore with imagination using those few simple props you bring out in the morning but then find yourself able to let go and acknowledge that the children might choose to play with the elements in a different way to that you had planned. Are the materials and props still being used? Is there dramatic play happening without you guiding the experience to a set outcome? Are you perhaps now able to focus on other things happening in the yard that need your direct attention like craft activities or gardening? Sometimes we get caught up trying to turn simple learning experiences into something that becomes overwhelming and time consuming to set up, maintain and pack away…when really we just need to provide a few simple elements and props from indoors and stand back to see what the children decide to do. Less is usually more when it comes to younger children and their play and they will find what they need or figure out how to get something else that works if we allow them the space to do so. 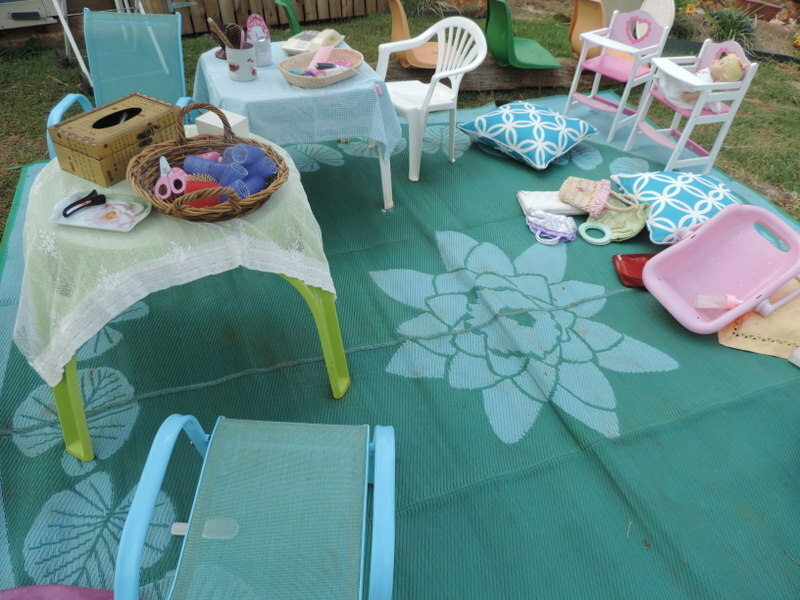 There is no rule however that says you can’t also set up more involved dramatic play spaces and provocations outdoors – I have done this quite often but then we tend to spend the whole day outside rather than having just an hour or so to play then everything must be packed up. 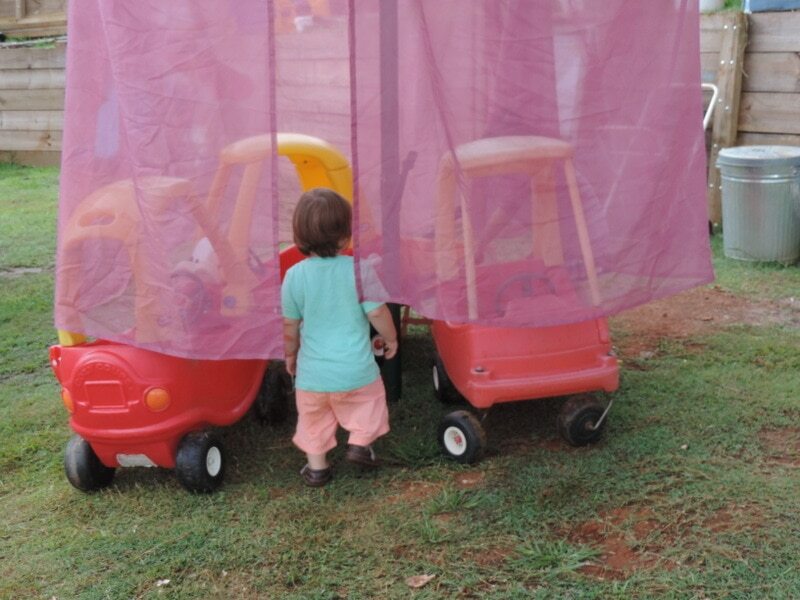 It often seems like there is more thought and planning into setting up interesting pretend play spaces indoors – perhaps as most educators spend a lot of time in the room or house; but why not make the transition to more of an indoor/outdoor program or at least allocate even time in each space so children can really take the time to continue their work? 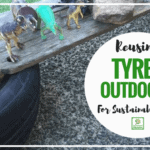 Let’s not underestimate how the outdoor environment if well thought out and resourced (I don’t mean with expensive equipment – I mean useful!) 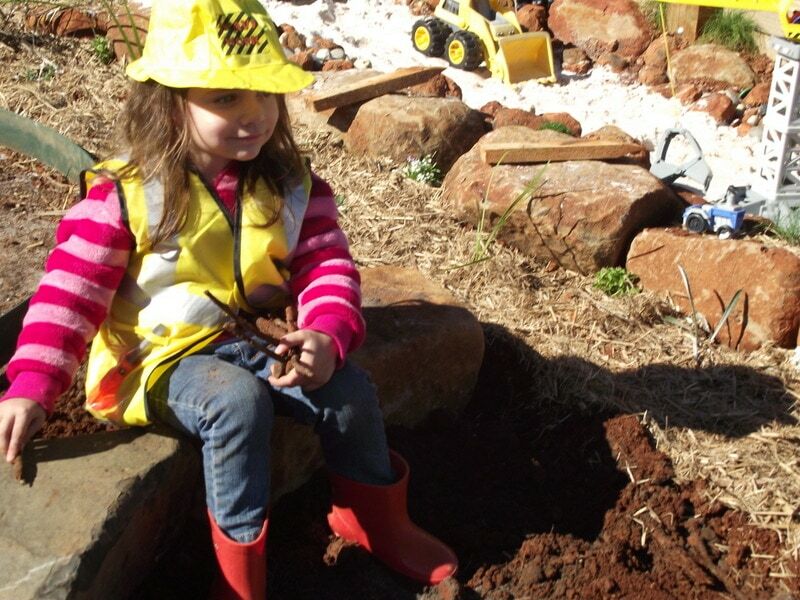 provides a wealth of opportunity for children to really explore, create, imagine and direct their own play. 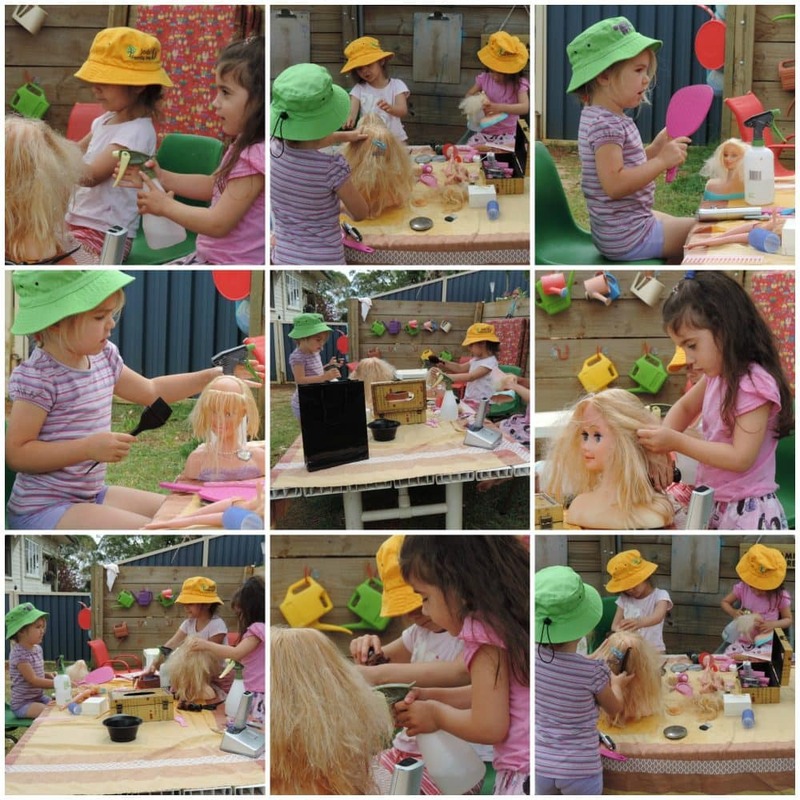 Taking pretend play outdoors can truly encourage children to explore dramatic play in a whole new way and often with more independence than in an indoor space. If you would like to download a print friendly factsheet with some of the tips and ideas in this post to help you get started and refer back to later just click on the image below. 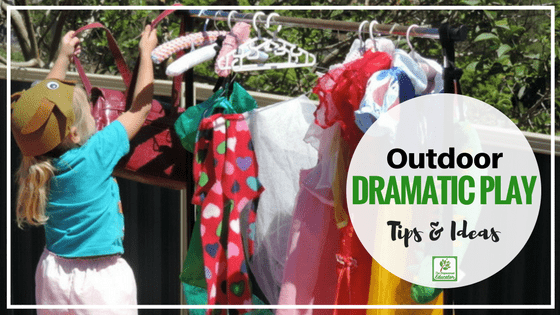 If you struggle to find interesting ways to encourage dramatic play into your outdoor play program and environment or hadn’t even considered the possibility I’ve got a few tips to help you get started! As I mentioned above, children are very clever at using what they have to explore different types of play but there are also some simple ways that educators and parents can help encourage children to engage their imaginations outdoors without it becoming a planning burden. 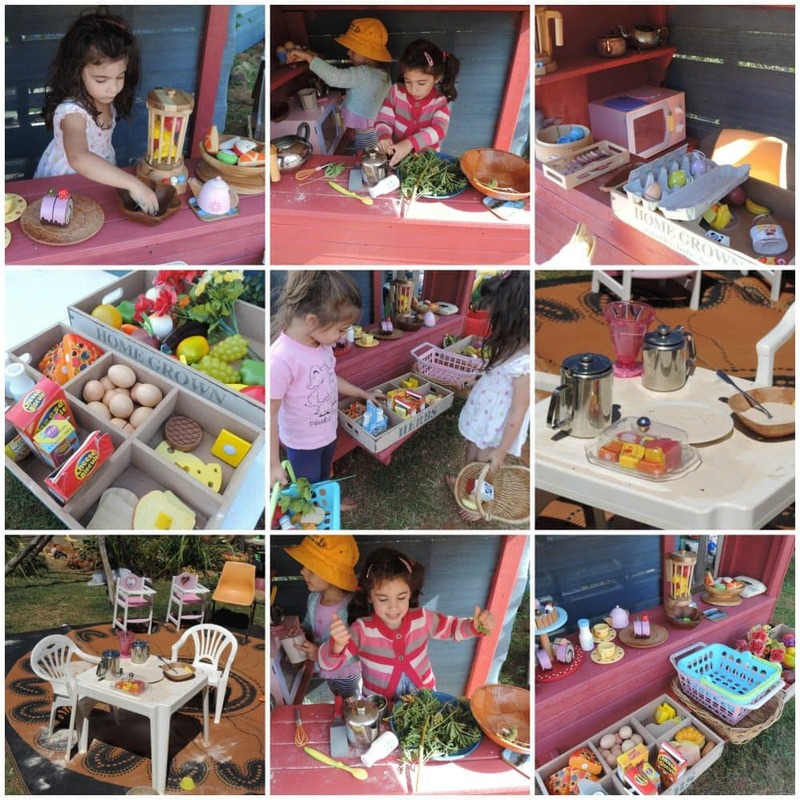 Simple ideas to invite dramatic play outside. 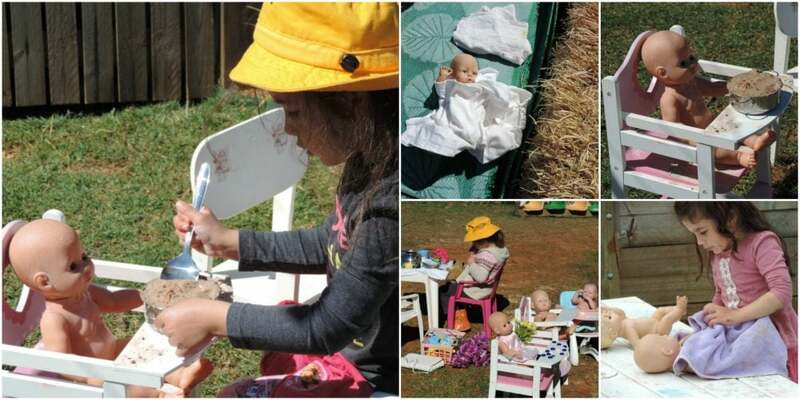 Provide real tools and real life materials for play in the sandpit, mud kitchen etc that children will find familiar. They may have used them before in their home or they might have seen others using them. 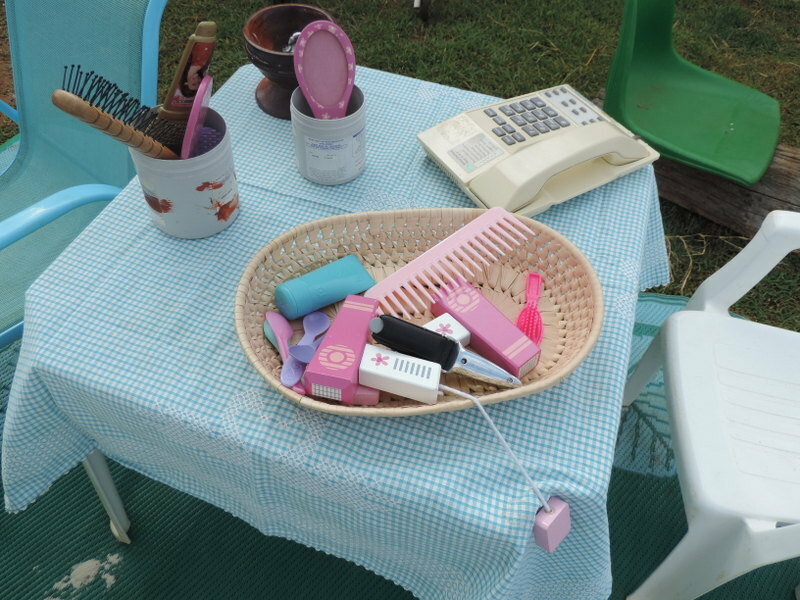 Some of the more popular ones I use are old phones, keyboards, clipboards, handbags, shoes and kitchen items. These real tools allow children to use their imagination and their understanding of the world around them to create and portray their roles and ideas as play unfolds naturally. 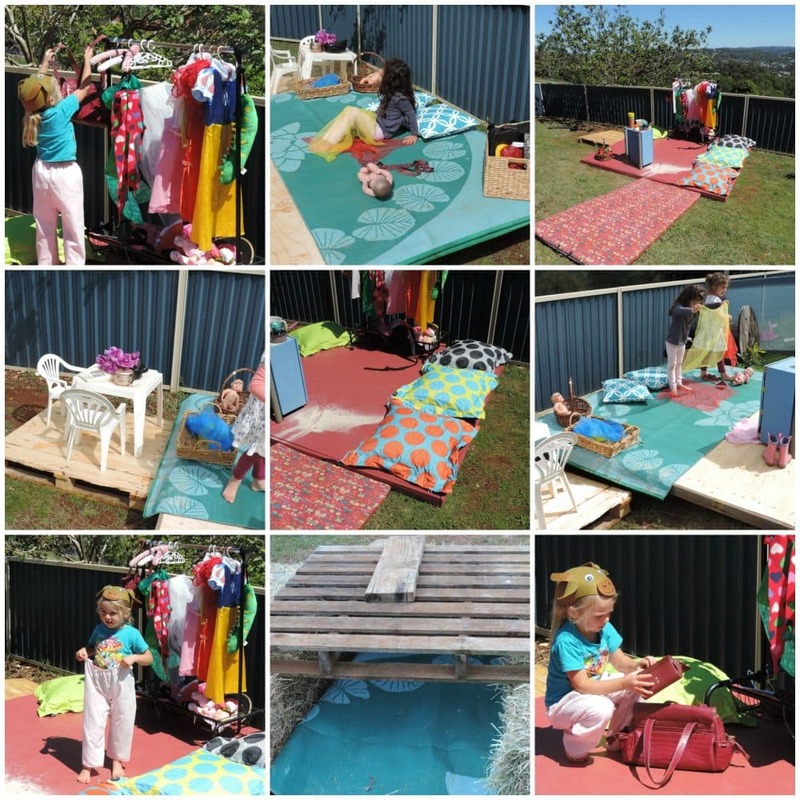 Take the dress ups outdoors and set up little stages or performance areas.Ensure access to lots of loose parts and open ended materials – change around regularly. 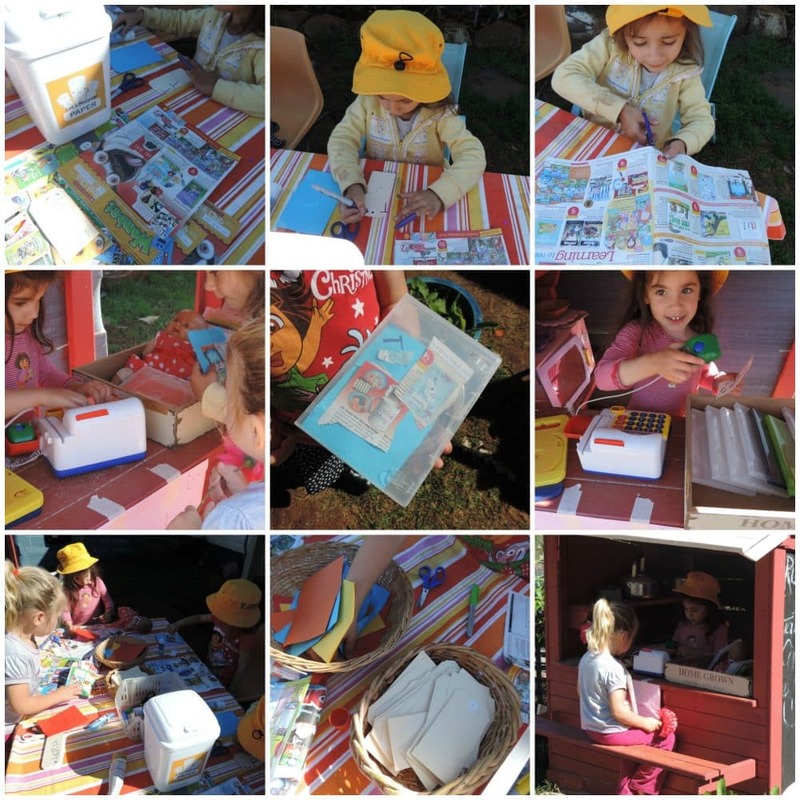 Extend upon current interests in favourite songs or stories and provide props in the outdoor area related to those stories and songs – then see what they do with them! Bring some of the traditionally indoor toys outside and observe how the children incorporate them into the play in different ways to indoors. Think about setting up some simple invitations to role play – think resources for doctor’s and vets, offices, markets, shops. The children can bring in different elements to extend on their play as they need. 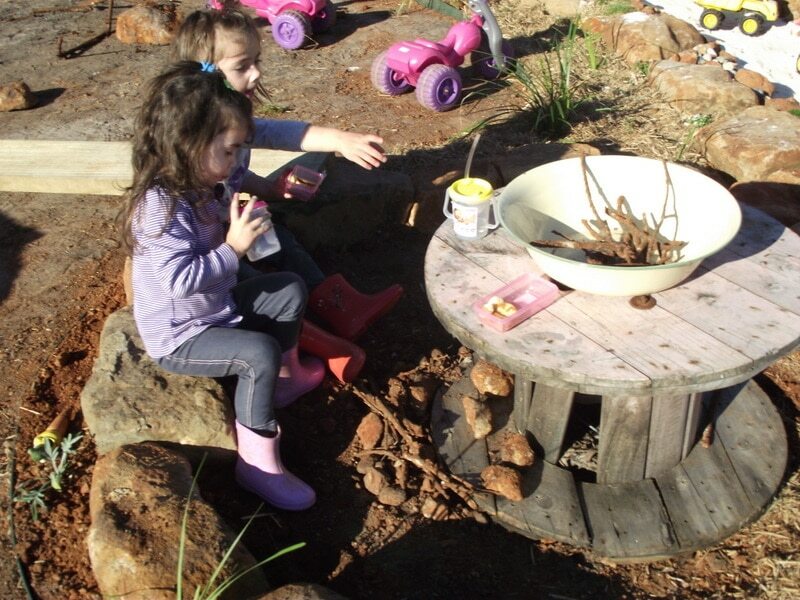 Ensure access to loose parts and open ended materials in the outdoor play space for children to source and add to their initial play props and arrangements. Keep a basket or plastic tub handy that is packed with soft materials like cushions, materials scraps, curtains, carpet squares. easy to bring out and back in each day if required. Plan ahead of time the props you want to introduce to the environment during the week and collect them together ready to grab each day if you don’t want to leave them outside or you want to change the theme each day. Consider spatial arrangements like secret and sensory spaces that feel enclosed and semi private. Think about how you might introduce design elements like mirrors on the walls, movable chairs and tables, stage areas, cubbies, teepees. 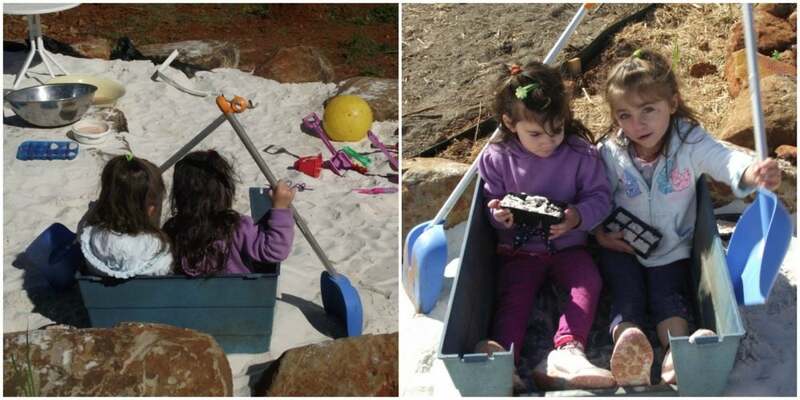 Engaging spaces also include abstract, linked and non fixed equipment to encourage opened ended play and challenge children to use something in a different way and stay engaged for longer periods of time. Provide access to both realistic and not so realistic resources for the children to experiment and engage with. 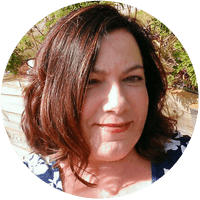 When adding props and setting up spaces and invitations consider the community in which you live, what is familiar to the children and their cultural backgrounds. 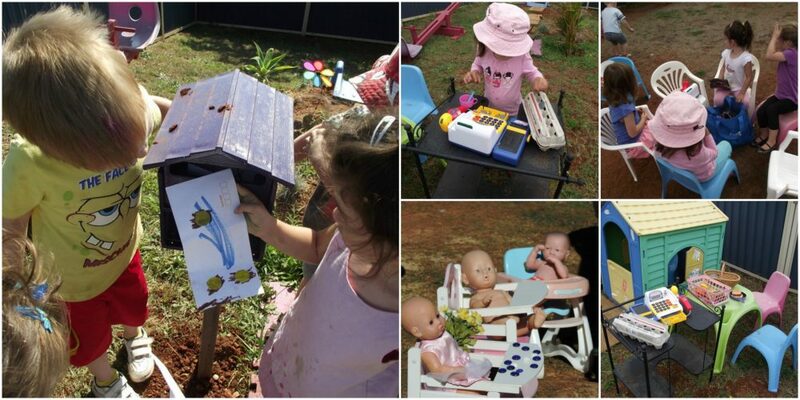 Feeling inspired to plan for and create opportunities for children to engage in pretend play outdoors? Need a few easy experiences and ideas to get you started? 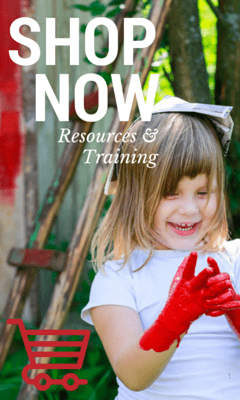 I’ve included some dramatic play experiences and setups from my own Family Day Care service over the years for you to explore below. 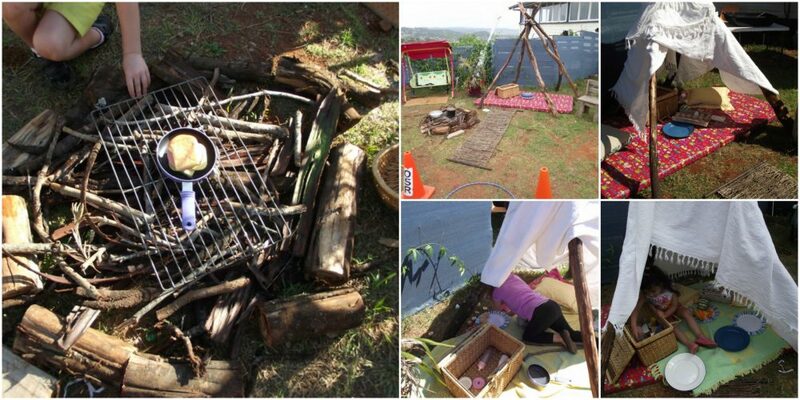 All use simple resources, loose parts, familiar props and real life materials to encourage children to enjoy dramatic play outdoors. The idea is not to try and exactly recreate these experiences and prompts but to take some ideas from here and there to modify for your own environment. Incorporate discussions about sustainability and caring for living things with a setup similar to this Garden Centre Shop. Scale it down or keep it going as a group or centre project and sell some seedlings, plants and vegies to parents and carers! We recycled some empty DVD cases and turned them into books for our outdoor library. The children cut pictures of their favourite books out of old Bookclub catalogues then stuck them to cards I had found in an op shop before adding to the ‘book’ . They all went into the ‘library’ for borrowing. This play extended in different ways for well over a week and it was a great way to reuse a few items from the recycle bin! On this day the children had decided they wanted to become vets as a loved pet had recently been taken for treatment. It was a lovely Winter Day outside though so I simply added a table, a few of our favourite soft animals, some small sheets and blanks, bandages and doctors tools! The pretend play extended to lots of other ‘critters’ in the yard throughout the morning. At the end of the day it all went into my big basket and we left it on the verandah to take out again in the morning. 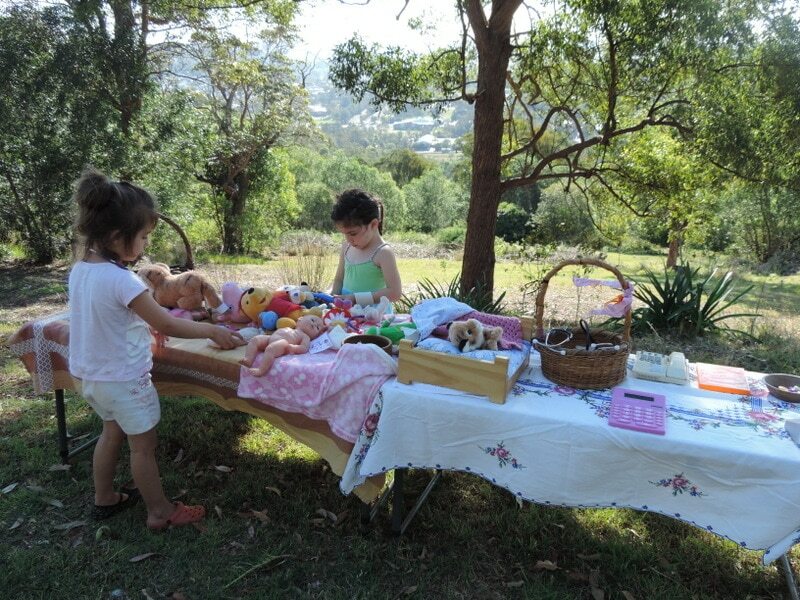 Similar to this was the doctors surgery we set up for the dolls and soft toys under the trees. 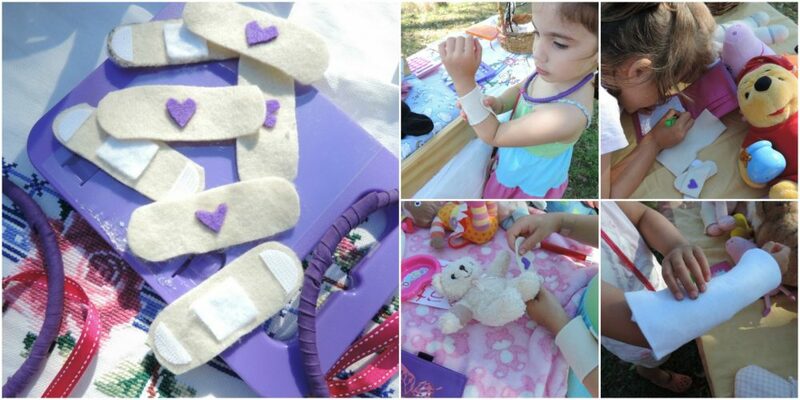 It was a whole lot of fun making our own bandaids, plaster casts and bandages from felt to use in the days before as well. 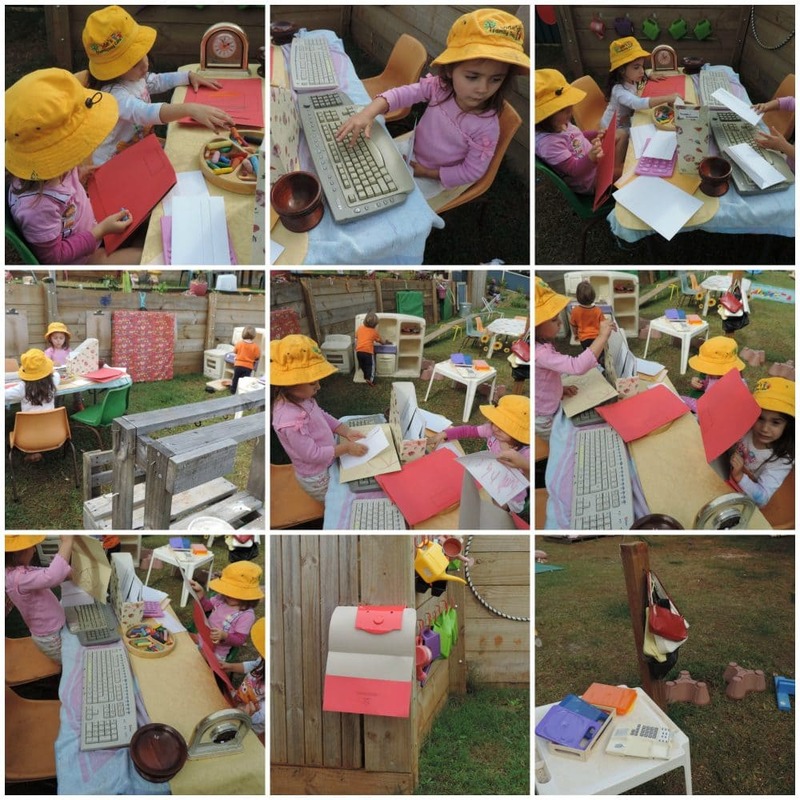 We’ve had fun in an outdoor office using old keyboards, folders, pens and phones. And then there were the performances and very involved imaginary scenarios and role play on the outdoor stages. 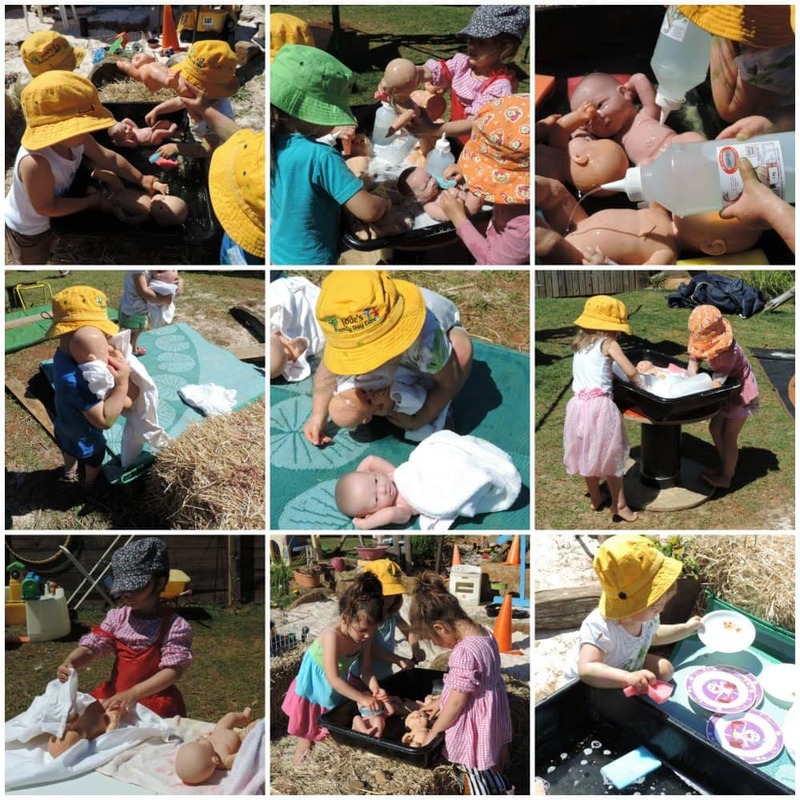 Baby dolls have been fed with mud, sand, water and herbs. Bathed and changed many times and then left to dry or ‘sleep’ in the sun. 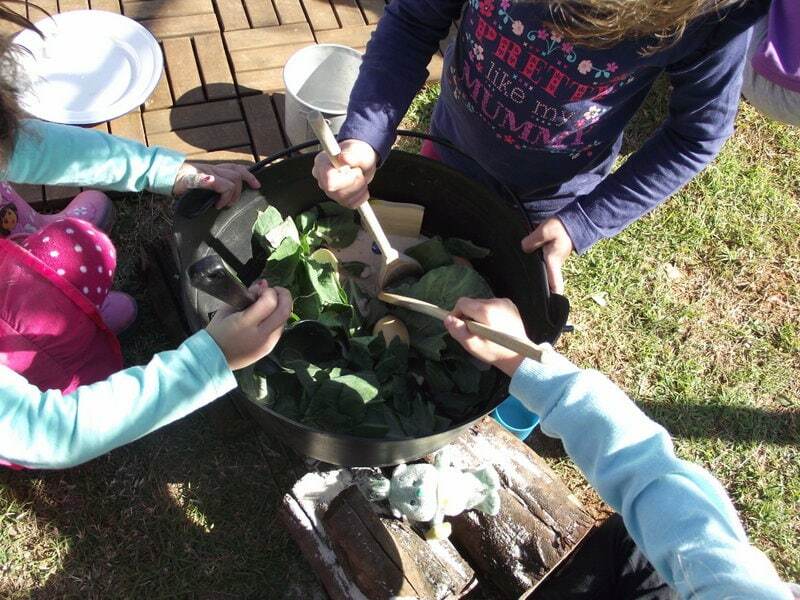 Campsites have been created and chefs have cooked up delicious treats to try using loose parts from around the yard and gardens. Ships have been sailed in large cardboard boxes and old dog kennels with spades as oars…. Car washes have been busy with the addition of a few sheer pieces of materials pegged onto the clothesline. Scrap paper, old envelopes, a letter box, pens, tables, pebbles, glass gems, scales, dressups and teasets from the op shop have created post offices, cafes and banks on different days. I obviously had quite a few parents who were coffee lovers at the time of this play because I often overheard conversations about making and serving coffee. 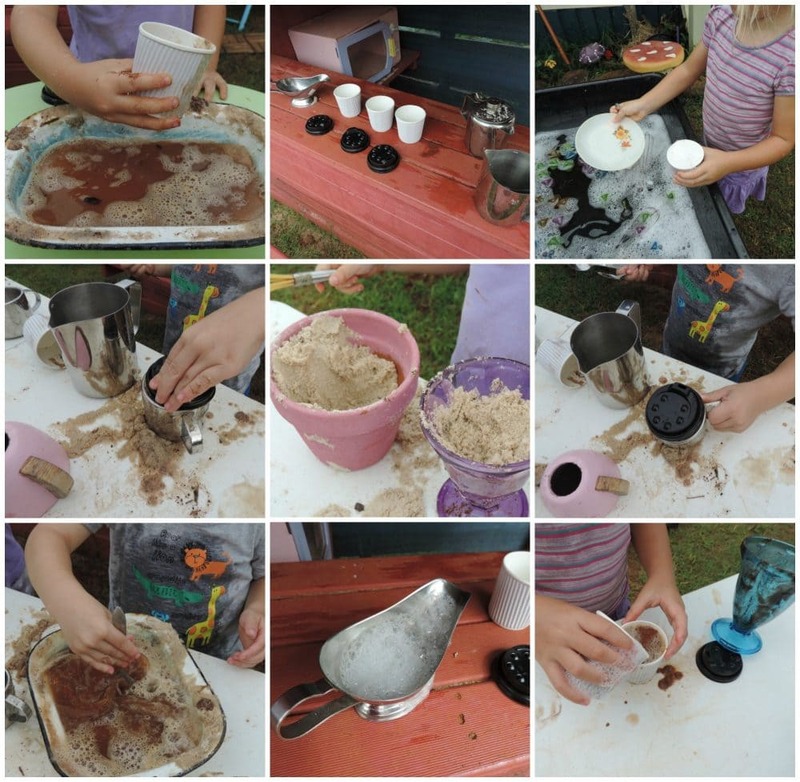 The addition of some bubbles whisked up in the water tub by little hands, a few mini coffee cups and jugs for pouring prompted some very busy coffee shop role play! Who doesn’t like a trip to the hairdresser? We threw a tablecloth over the art table, added props from our hairdressing box (which includes both brought materials and also old makeup compacts, spray bottles, combs and brushes, empty hair product bottles and velcro rollers) then brought the dolls heads out from inside for a little makeover. 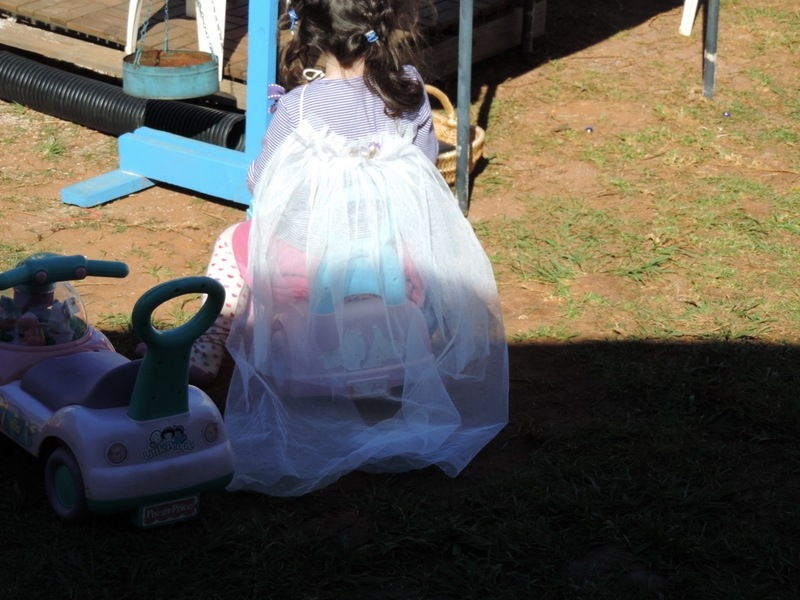 Empty pump bottles filled with detergent and water help little hands give hair a shampoo outside too. 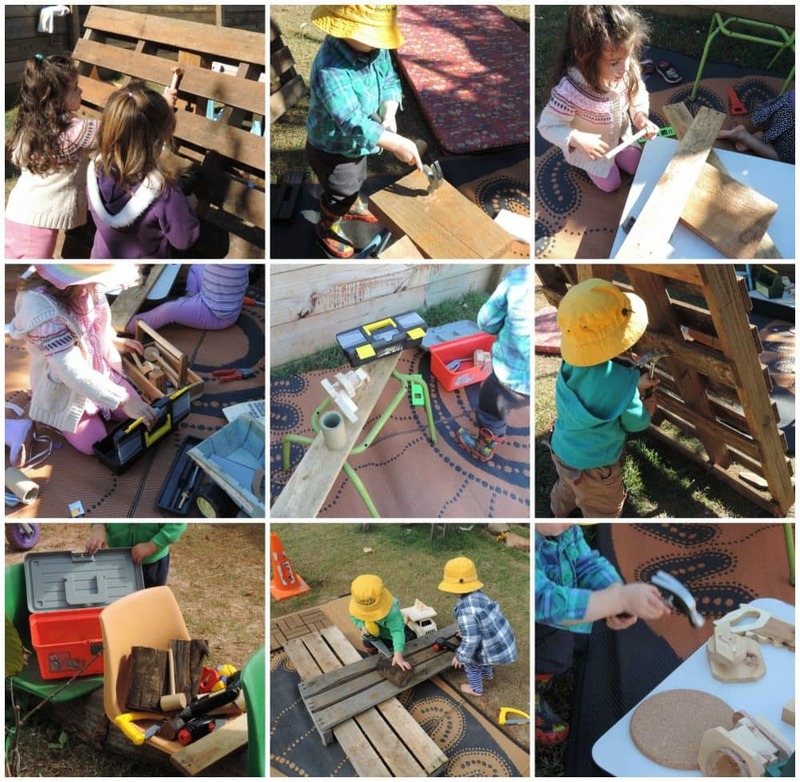 Toolboxes and a whole lot of natural materials and loose parts set the scene for a Tradie construction site that went all over the yard. 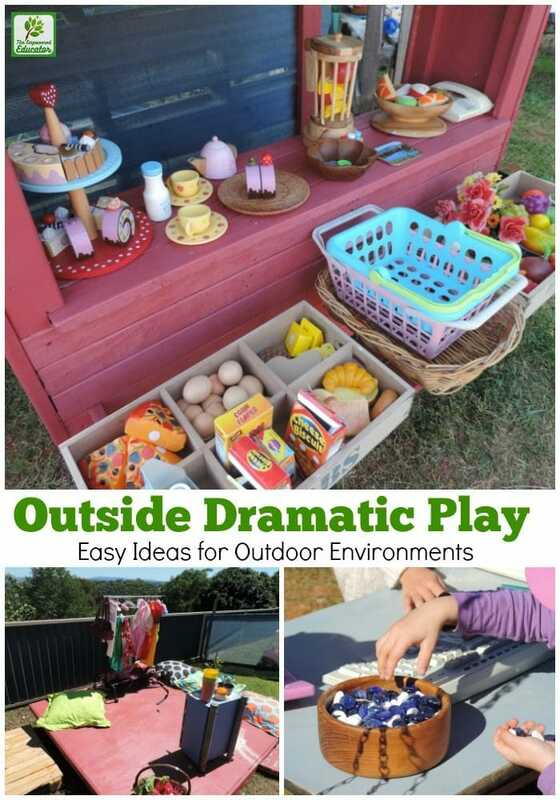 And one of the most popular spaces in the outdoor environment has been the Pallet Market Stall – it has served as the launchpad for so many different dramatic play experiences (some I have shared above). 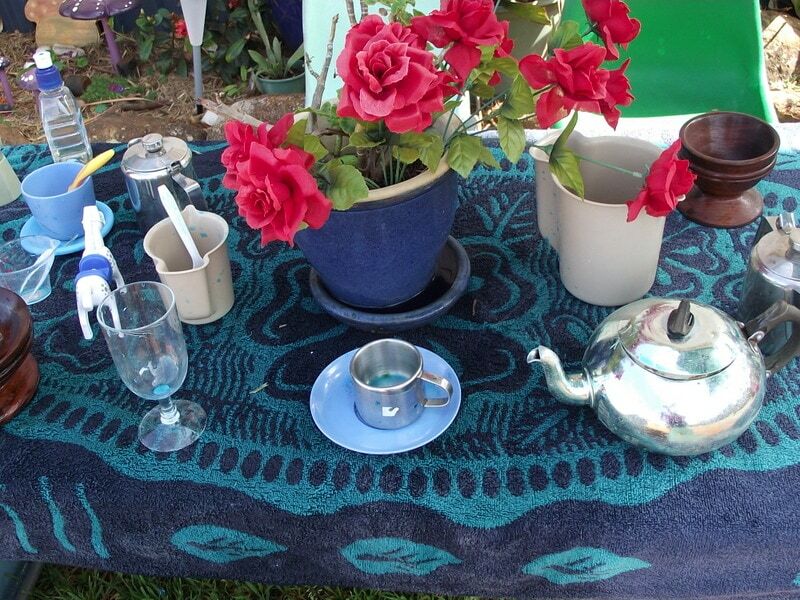 I usually add a few props and sometimes they are more involved like this cafe and market stall. 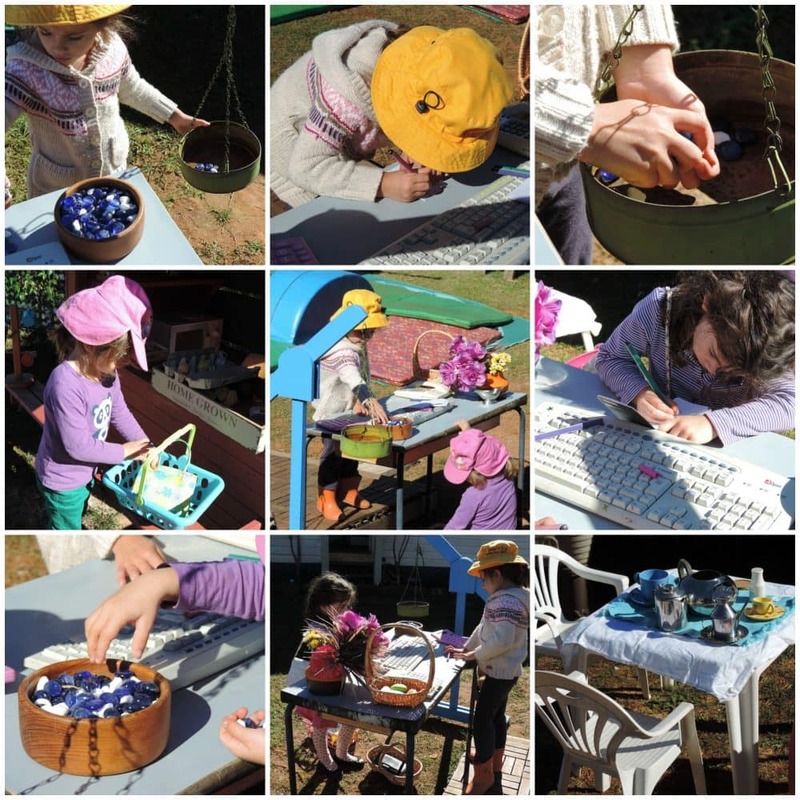 But the children also create their own environments and scenes with no prompt from me using sand from the sandpit, pebbles from the quarry, plants and herbs from the garden and the real life cooking tools that are always available somewhere in the yard to mix up some messy, imaginary fun. 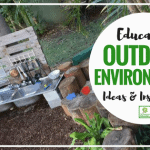 Now you have a few new ideas to try…Why not consider taking the time to set up your outdoor learning space a little differently next week and invite more opportunities for dramatic play outside? 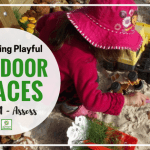 The time you take to encourage dramatic play in outdoor environments with a few of the simple tips above will ensure long lasting positive effects on children’s physical, cognitive, emotional, and social development….and it’s fun! Looking for more inspiration like this for early learning? 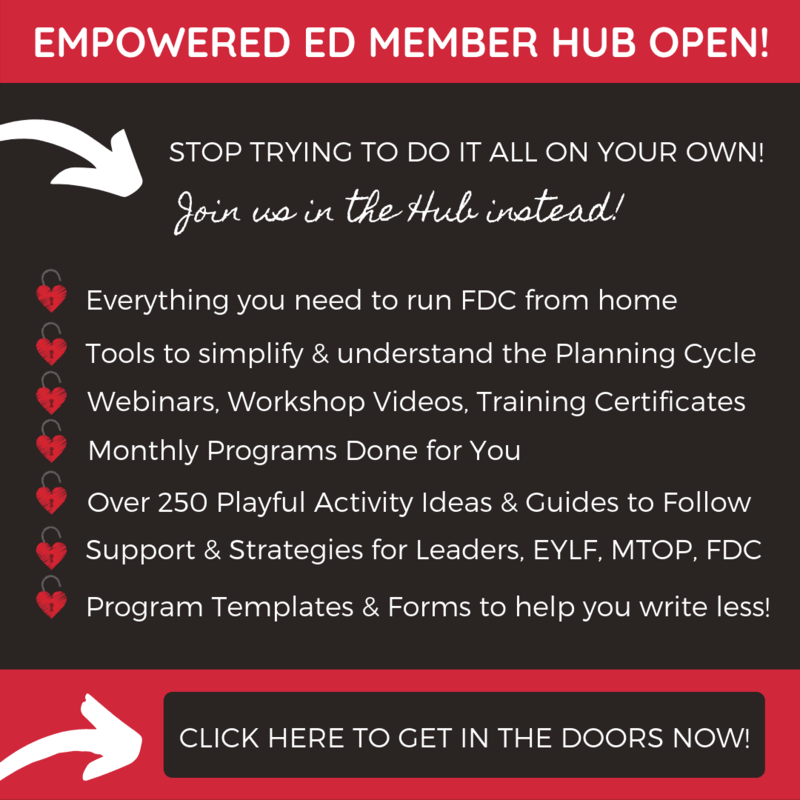 Join early childhood educators from across the world in the Empowered Educator Community. 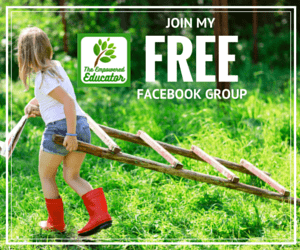 Download a FREE print friendly factsheet to help you get started providing more dramatic play outside by clicking or tapping below!